C. S. Roos, Mannheim (sale, C. G. Boerner, Leipzig, 19 June 1937, no. 305). (C. G. Boerner, Düsseldorf, 1971); NGA purchase, 1971. Roma e lo stile classico di Raffaello 1515-1527, Fruttiere di Palazzo Te, Mantua; Akademiehof, Graphische Sammlung Albertina, Vienna, 1999, cat. no. 202. Recent Acquisitions and Promised Gifts: Sculptures, Drawings, Prints. National Gallery of Art, Washington, 1974:199. Ward, Roger Barry. 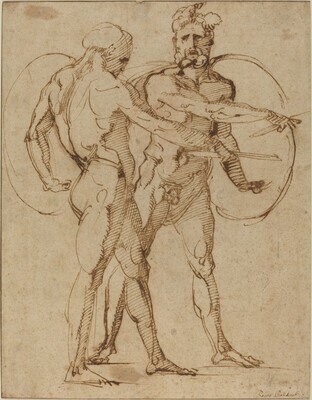 "Baccio Bandinelli as a Draughtsman," Ph.D. dissertation for the Courtauld Institute of Art, University of London, 1982, 414, no. 415, fig. 61.